YS Tech announces major motor upgrade for the 120mm fan models! YS Tech Engineers have redesigned the entire line of 120mm fans, including the 25mm, 32mm and 38mm thick models. The old motor and PWB circuit designs limited the fan’s performance and the Engineers were just not happy with that! New designs include Microcontroller support in some models (more on that later). bility. YS TECH’s new motors have abundant torque, enabling solid performance in the most demanding of applications. Coupled with solid mechanical design, these features support the life figure of OVER 60,000 hours of continuous service. Your designers and Engineers were most probably painfully aware of the previous maximum figures obtainable for CFM with the old 120mm fan motor designs. But, not anymore! The old hurdle of approximately 120 CFM has been significantly by-passed for specs approaching 300 CFM [XYW – 38mm thk models]! Pressure figures have been dramatically increased as well. Of course, YS Tech has maintained 120mm models with less CFM and pressure for those less demanding applications. While increasing the LIFE expectancy. Your customers are now able to choose the most cost-effective YS Tech product. The new S Series is the latest development by YS TECH. These models incorporate a Microcontroller, controlling all of the fan operating functions to a degree not possible before. 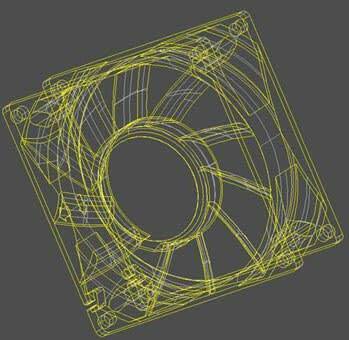 State of the art motor simulation software and CFD optimization have been utilized to come up with a new series of fans that have very low current draw, high rpm, high pressure and long life characteristics. Beyond these new 120mm designs and the incorporation of Microcontroller technology, our Engineers are developing their approach to 3-phase motor controls. Stay tuned for that new development! Be sure to give me a call with any questions you may have.